Memorial Day officially starts BBQ and picnic season, so I thought, why not highlight the fabric of the outdoor cooking season - gingham. 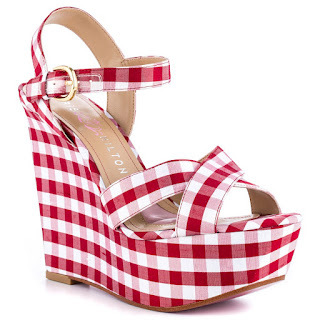 Featuring the traditional red and white "picnic in the park" fabric, classic wedge silhouette, adjustable ankle strap, overlapping vamp straps to keep your foot firmly in place and a statuesque 5" wedge with 2" platform, the Paris Hilton Amina Wedge allows you to show your love and support of America without going full red, white and blue. Now if for some reason you're not into the traditional red and white gingham, the Amina Wedge also comes in green and white gingham or black and white gingham. All three colors are only $89.99 on heels.com but you get 20% off when you use code their Memorial Day Sale coupon code - VALOR.